The Nobel Laureates take center stage in Stockholm on 10 December, when they receive the Nobel Medal and Diploma from King Carl XVI Gustaf of Sweden. An important part is the presentation of the Nobel Lectures by the Nobel Laureates. In Stockholm, the lectures are presented days before the Nobel Prize Award Ceremony. In Oslo, the Nobel Laureates deliver their lectures during the Nobel Peace Prize Award Ceremony. Since 1901, the Nobel Prizes have been presented to the Laureates at ceremonies. The Nobel Peace Prize is awarded in Oslo, Norway and the Nobel Prizes in Physics, Chemistry, Physiology or Medicine and Literature and the Prize in Economic Sciences are awarded in Stockholm, Sweden. 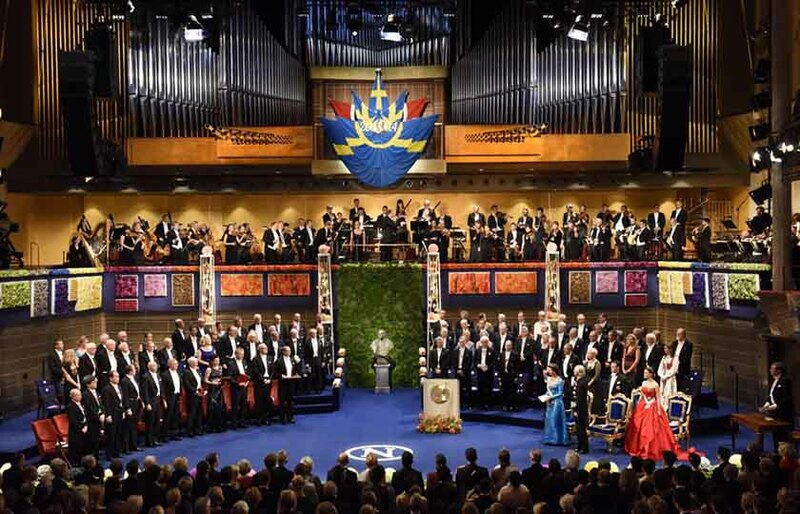 A short introduction to the Nobel Prize Award Ceremonies and Banquets. The menus from the Nobel Banquets give a historic glimpse of what was served at the 20th century feasts. Read some personal memories from the first ever Nobel Prize Award Ceremony on 10 December 1901. Literature Laureate Isaac Bashevis Singer said he was often asked why he wrote in Yiddish. In his Nobel Banquet speech, he revealed the four reasons why he didn’t abandon his mother language. Medicine Laureates Linda Buck and Richard Axel share some of their memories of the Nobel Day 2004 in a video interview. Watch the 2011 Nobel Banquet and the preparations before the festivities – condensed into just two minutes!